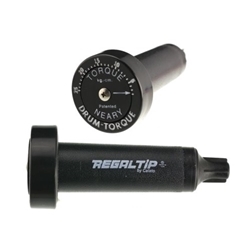 Regal Tip DT-1 Drum Torgue. Get this to keep your drums sounding great! This is a torque wrench designed to tune musical drum heads quickly and accurately. The Drum Torque allows drummers complete freedom in consistently selecting preferable drum head tension values and enables those values to be consistently duplicated and maintained. Laboratory work, employing strain gages bonded to a drumhead surface, has shown that the tension across the surface of a drum head is directly related to the torque applied to the tensioning bolts. Drum Torque Replacements are also available.